I've received so many emails recently about giant puffball mushroom identification and cultivation. It seems these massive mushrooms intrigue and delight many people! Not surprising, given their unique and impressively large appearance. Combine their sense of visual whimsy with the fact that they're edible, and you have a recipe for a very in demand mushroom. This always brings about two questions: where can I find them and how can I grow them? While I always encourage checking all finds with a local expert if you're a beginner, there are some simple rules that are pretty safe to follow with Calvatia gigantea, the giant puffball. So let's answer some of those giant puffball queries! When you find a puffball, always slice it open lengthwise and check the inside. It should be firm white flesh, with no developing gills. If you see any evidence of gills, disregard immediately. Some species, including the deadly amanita, have a "universal veil" of tissue that surrounds the mushroom when young. This can make it look like a puffball. If your mushroom is the size of a soccer ball, it's extremely unlikely that you've found an amanita. However, in the interest of safety you should always cut it open and check. You want the inside to be white and firm, with no other colors or structures present. Always do this! Giant puffballs are aptly named. They are usually quite large, reaching soccer ball size or bigger. They usually have a circumference (distance around) of 4 to 30 inches, although larger ones are not uncommon. There is no distinct cap and stem with these mushrooms; instead they exist as just large, white globes. They may not be perfectly round. 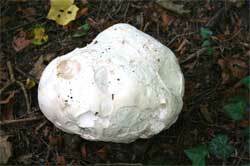 Giant puffballs are white with firm white flesh inside. If they appear yellowish or brown is means that the mushroom is about to/has gone to spore, and is not edible anymore. Before the mushroom turns brown or becomes too mature, there will be a point when the white the exterior cracks and the white interior shows through. This is a good time to harvest the giant puffball for cooking. Brown, although by the time it releases its spores it's long past the point of being edible. Found in open, grassy fields and meadows, although they can appear in deciduous forests. Many people find them in well-fertilized open areas such as their lawn. Always grow on the ground, never on trees or logs. Late summer to early fall, usually August through October depending on the region. 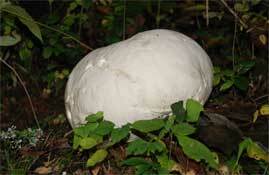 Note that there are other species that are sometimes considered "giant puffballs" besides Calvatia gigantea. Depending on where you live, your mushroom may look a little different. Get in touch with your local mycology club to learn more about what's in your area! I have had a giant puffball grow in my backyard for the last 4 or 5 years, migrating slowly but always appearing in the same general area. This year I feel quite certain of the species and I plan to harvest, saute and try it out (robbing the kids of their chance to stab it and kick it). It usually grows to about 12 inches across but it got a rocky start this year, as I saw lawnmower tracks over it's squashed remains 2 weeks ago. A week ago it rallied and looks as good as it ever has. Do you know if it's possible to multiply/propagate these? I tried spreading the spores around the yard last year and still got just one! Scott's email brings up an interesting and often-asked question: is giant puffball mushroom cultivation possible? I'll admit that I've never grown a giant puffball, and I've never heard of anyone else doing it either. All of the cultivation books I checked either didn't mention them at all, or stated that at the time of their printing we still didn't know how to cultivate Calvatia gigantea. (As of 2007). So in pondering Scott's question, I turned to a straight-up Internet search. For as we all know, the Internet is a bastion of accurate information. Surely I would find something, right? Not really. I was unable to find anyone who could provide proof that they've grown a giant puffball. There are some claims of success out there, but nothing succinctly documented from start to finish. I found one person who even posted pictures the spawn that they propagated from puffball mycelium, but nothing about fruiting the actual mushrooms. What many people do say has worked, and I can believe it, is to do exactly what Scott did and spread spores around. This is no guarantee, of course, and highly subject to the whims of nature. Still, it's a cheap and fun experiment. So why not try the spore slurry method? First you'll need to let your puffball ripen to the point where it turns brown and goes to spore (right). Once this happens you'll have more spores than you know what to do with! Start with some clean, non-chlorinated water in a food-safe container. A gallon or two should suffice. Add a pinch of salt and about a tablespoon of molasses to the water and stir. You don't need much of each. The salt is to inhibit bacterial growth; the molasses is to provide sugars for germinating spores. Add the puffball spores and let the mixture sit covered for 1 to 2 days in a temperate place. Any longer than that and you risk bacterial contamination. Cast your mixture somewhere that's conducive to puffball growth. This is important, as pouring it where they don't normally grow probably won't help you much. Try on the ground in grassy fields, lawns, meadows, or places where you've seen them growing in the past. That's not to say that you can't experiment! Try the spore slurry method with pieces of the puffball itself, rather than just spores. Try to make puffball mushroom spawn on cardboard using this method. Let us know about any successes or failures that you have by posting them here. You can see why so many people would rather learn puffball mushroom identification over cultivation. It's much easier! By now you may be asking yourself, "Why is giant puffball mushroom cultivation so difficult? Why can't I just easily grow them like oysters?" The answer lies in how Calvatia gigantea feeds itself, and how little we understand about that. Once thought to be saprotrophic, giant puffballs are now considered mycorrhizal. Let's explore what these terms mean. A saprotrophic mushroom is one that feeds on dead or decaying organic matter. These types of mushrooms are easier to grow, as one can provide them with the organic matter (straw, wood chips, etc) they need. It's not hard to simulate this type of environment. 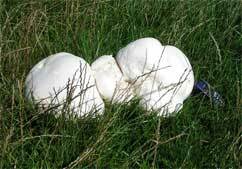 As giant puffballs tend to pop up in well-fertilized lawns, I've read some theories stating they feed on the manure in the fertilizer as well as on decaying grass. A mycorrhizal mushroom is one that is engaged in a symbiotic relationship with the roots of plants. The mushroom receives sugars from the deal, and the plant or tree gets water and mineral nutrients from the fungus. The fungus essentially increases the reach and surface area of the plants roots, like fingers spreading further through the ground. Read more about mycorrhizal fungi here at Wikipedia. When it comes to cultivation, the problem with mycorrhizal fungi is how to simulate this relationship? You can't "make" spores or mycelium interact in the right way with the right plant, if you even know what that is. It's simply too complex to fake, and you can't do much but try to create the right conditions and hope for the best. Chanterelles are an example of such a mushroom, and giant puffballs are suspected to be as well. This would explain why they are so hard to grow, as they probably have a symbiotic relationship with certain types of grasses. At this point in history we're all experimenting, just like Scott did. Keep at it with puffball mushroom identification and cultivation. Let me know how it goes! Picture 1 used for puffball mushroom identification by Jarek Tuszynski and is from Wikipedia under the GNU Free Documentation License. Picture 2 used for puffball mushroom identification by Jean-Pol Grandmot and is from Wikipedia under the GNU Free Documentation License. Picture 3 used for puffball mushroom identification and cultivation by Nathan Lee and is from Wikipedia under the Creative Commons Attribution Share-Alike 3.0 License. Picture 4 used for puffball mushroom identification by Dave Dunford and is from Wikipedia under the Creative Commons Attribution Share-Alike 2.0 Generic License.